Do you have a favorite holiday recipe? 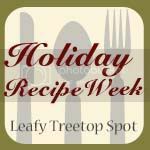 Tricia over at Leafy Treetop Spot has a fun linky party going on where you can share (and find) favorite holiday recipes. Head on over and link up some of your faves… after you check out this super simple fudge recipe, of course. Fudge is a holiday classic and this recipe is easier than easy, and it stores wonderfully in the fridge. Place chocolate chips, sweetened condensed milk, and butter in large microwaveable bowl. Zap in microwave on medium until chips are melted, about 3-5 minute, stirring once or twice during cooking. Stir in nuts, if desired. Pour into well-greased 8×8-inch glass baking dish. Refrigerate until set. Of course, you can also melt the chips in a pot on the stove with your milk and butter, I usually do it this way, but in a pinch, the microwave is quicker. Enjoy! Looks delicious… and easy indeed. Thanks. Have a yummy weekend! Yum. It looks so smooth! all I can say is “yum” ! I wish I’d seen this earlier…..My husband was really wanting me to make fudge this Christmas…… I’ll try it soon though! I ended up making this and have been handing it out to friends and family. I can’t tell you how many compliments I’ve received (and I never receive compliments on my baking). Thanks much for the recipe! Yuumy !!!! so trying this for Christmas !!!!! I made this fudge this weekend. What a hit!! Thanks for sharing. I foresee many an event where this fudge will be the highlight! 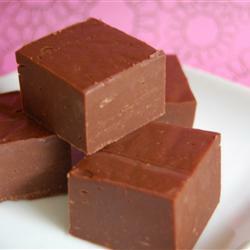 I love fudge, and a ‘Super Simple’ version is even better! Thanks for linking to This Week’s Cravings! Wow! That looks super easy! I might have to try it! Yum! I love fudge but I’ve never made it myself. This seems simple enough that I definitely will. Thanks for sharing! It is so simple! I’m vegan, but I LOVE fudge. I’m posting a great recipe next week. When you said super simple, you meant it! I don’t see how I could possibly screw this up! Thank you. Had decided to skip fudge this year, because my recipe called for the marshmallow fluff (someone else mentioned this), cooking the butter & sugar to this stage, then stirring &/or folding in. Basically sounded like too much work & yet another trip to the store. Yours scores high on my radar screen because I already have all the ingredients in my pantry. Yea, I’m making these! Thanks for sharing. I love fudge! I will be trying this. Thanks for sharing over at Tuesday Tell All. Hopped over here from Between U & Me. Wow! Looks so good! I’ll have to try them and maybe swirl some peanut butter in it for my PB crazed son. I have a recipe that’s pretty close to this, but I love the alternative for it. As it turns out, you can substitute peanut butter for the butter! It’s soooo yummy! Wow! You’re killing me, lol! Yummm!!! Maybe a recipe that I can actually do! I would be thrilled if you stopped by my Commercial Break Thursday at http://suzysartsycraftsysitcom.blogspot.com/ and linked this project! this looks amazing and easy! i will have to try it! I’m hosting a giveaway right now that you might be interested in! Stopping over from Between U & Me. Great recipe, I have always made mine with marshmallow fluff (I know, sounds weird) but I will try your recipe for sure! That IS super easy! My daughter has been begging for fudge and I was think blah….that’s too much work! Thanks for sharing! mmmm! Picture me licking my lips!!! Looks delicious. Dang that just made my scale hide further under the sink…Run and hide I say…tis the holidays after all! I’m hosting my first Food Fight Link party this Friday and would love it if you dropped by and shared. I’ve yet to be able to master fudge. Must try this one! Poppin’ over from the virtual cookie hop! I LOVE FUDGE and this sounds so easy. Wow that is super easy. I will have to try it! Wow! That looks so good and sounds so easy. I’m not very good in the kitchen but I think even I could handle this one. Thanks!